Jens "Fresh_oO_D" Lakemeier had a great long weekend at this year's WCOOP, winning his 3rd COOP title in event 23-H: $1,050 NLHE [6-Max] for $97,459, and also taking 4th place in event 82-H ($10,300 NLHE High Roller) for another $204,630. Jens "Fresh_oO_D" Lakemeither can often be seen at PokerStars high stakes mixed-game tables where he has won over $70,000 this year. However, it's likely he'll remember 2017 more for his tournament scores. As well as this weekend's +$300k WCOOP scores, Lakemeier won his first WSOP bracelet earlier this year in the inaugural $2,500 big bet mix event for $112,232. His victory this weekend marks his first WCOOP title, although he is now a three time COOP winner, already having won two SCOOP crowns. To take the title Lakemeier had to negotiate a 690 strong field which included a ton of top talent including the likes of Bryn Kenney, Igor Kurganov, Jon "PearlJammer" Turner, Andre Akkari, Luke "lb6121" Schwartz, Shawn "buck21" Buchanan, azn_baller, Dario "Secret_M0d3" Sammartino to name but a few. 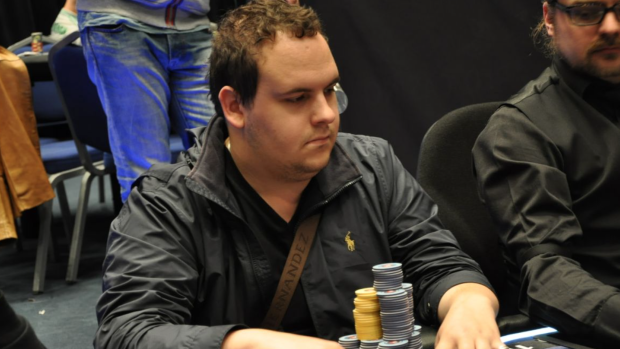 Having comfortably made the final table third in chips, Lakemeier was never in any danger and by the time the table reached three-handed play the remaining players (Fresh_oO_D, T3G3S, and Juan Martin "xPastorcitox" Pastor) decided to take time out to make a deal (xPastorcitox: $81,235.45 Fresh_oO_D: $83,659.68 T3G3S: $84,059.61) and to play for the title and the remaining $13,800. After half an hour of push/fold action Lakemeier finished off TG3GS when his Q♦Q♣ met his opponents 5♦5♥ all-in preflop, sending him into heads-up play with xPastorictox with a 2:1 chip deficit. That deficit soon swung the other way, however, as Fresh_oO_D doubled up after making the nut-flush on the river in another all-in pot, and he eventually took all the chips after flopping top pair with T♥A♥ on a 6♥ T♦ 3♦ board. xPastorcitox pushed all in with 8♦7♦ with flush and straight draws, but the 5♣ turn and 3♣ river left xPastorcitox high and dry. Fresh_oO_D won $112,232 and his first WCOOP crown. Just a day later and Lakemeier's bank balance grew even fatter when he managed to final table the $10,300 NLHE high roller and finish fourth for $204,630. The event, which featured some of the best players in the world including the likes of Viktor "Isildur1" Blom, Chris "Moorman1" Moorman, Andreas "Educa-p0ker" Artinano, LLinusLLove, BERRI SWEET, and Charlie "Epiphany77" Carrel was won by Canada's Patrick "prepstyle71" Serda for a huge $469,190.91. Serda is probably best known for allowing Will Kassouf to take last year's EPT Barcelona €10k High Roller title in exchange for a favourable chop heads-up. fresh ood is a legend, im sure he'll have even more success going forward !